ADVATx is the world’s most advanced solid-state yellow laser for effective treatment of vascular skin conditions, acne, scars, warts, and wrinkles. ADVATx is developed for dermatologists and physicians who are looking for the most advanced solutions for highly desired treatments, without pain, downtime, or expensive consumables. Consisting of two laser modules, one emitting 1064nm, the other 1319nm, a shared Q-Switch modulates both to generate a pulsed train of light. ADVATx uses high-powered, 589nm, yellow light, the wavelength which is widely acknowledged as the gold standard in treating vascular conditions. 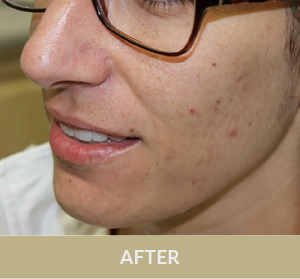 After the first treatment with ADVATx, the patient will see significant reduction in his or her skin disorder. The treatment with ADVATx is gentle and close to painless, and side effects are minor and limited to mild swelling and redness. The 589nm wavelength is FDA cleared for treatment of inflammatory acne vulgaris, port wine stains, telangiectasia – face/legs, rosacea, hemangioma, venous lake, angiomas, scars, striae, warts, wrinkles – periocular/periorbital, poikiloderma of civatte, and psoriasis. The 1319nm wavelength is FDA cleared for treatment of fine lines and wrinkles, atrophic acne scars, and mild/moderate inflammatory acne.